Do you pray some form of the Divine Office, the Liturgy of the Hours? This liturgical tradition is as old as the Church, built on the earliest Christian practice of praying the psalms and reading the Scriptures daily. When I was a child, I would peer out the classroom window as the priests of our parish, their cassocks flapping in the Santa Ana winds, paced the schoolground with little black book in hand, their lips moving as they read the Office prescribed for all secular clergy. On rare visits from Father Peter, my dad’s cousin who was the Superior of the Columban Fathers, my sister and I would be cautioned to give him quiet time “to read his breviary” before he got back to astonishing us with coin tricks. In later life, I was privileged to join religious orders of women or men who chanted the canonical hours—Matins and Lauds, Prime, Tierce, Sext, None, Vespers and Compline—in community, as all religious were required to do. The beloved Gregorian chant albums of monks like the Benedictines of Norcia, newly popular with listeners of all faiths, are the monastic Divine Office shared with the world. 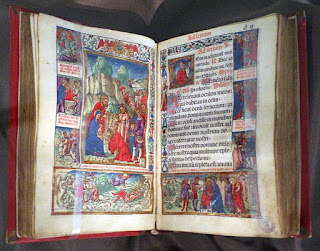 Over the centuries, the Divine Office, with its sequence of psalms, antiphons, versicles, lessons, and prayers, has often been revised. (The word breviary, describing the book but also the practice of reciting the Liturgy of the Hours, actual means “a briefer version,” condensed a bit from the longer and far more ornate office once celebrated in Rome.) The revision with which most of us are familiar came about in the 1970s, as the Divine Office was simplified and universalized to encourage its use not only by priests and religious, but by the whole Church in communion. I remember receiving my first copy of The Prayer of Christians, an early English edition of the revised Divine Office, from my husband as a Christmas gift. I was pregnant with our son. To begin the days as we did then, praying Morning Prayer in the car on the way to work, gave a richness of meaning to the words from the Canticle of Zechariah—“You, my child, shall be called the prophet of the Most High, and shall go before the Lord to prepare his way”—and united us with the whole praying Church. 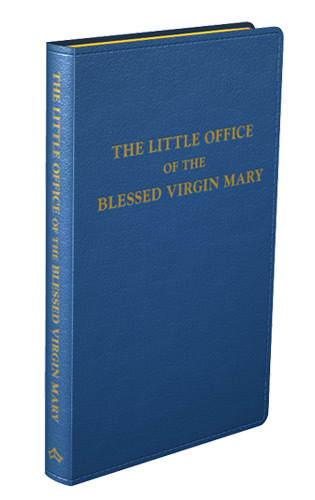 Today, I try to find time to pray the daily office, but am more likely to settle for one of the “briefer breviaries”—the streamlined Morning, Evening, and Night Prayers provided by publishers of monthly missals like Magnificat or Give Us This Day. You may do this, too, perhaps without knowing what a long and glorious tradition we are weaving into our hours. What does this have to do with Mary, and her “Little Office"? Read the rest to find out. The Little Office has been a wonderful source of prayer and scriptural reflection for me. I tried to pray the Liturgy of the Hours but it was always too complicated for me to really track without effort. The lLittle Office is both simplier and shorter, while retaining a rich depth of Psalms for daily prayer. For my own use, I prefer the post-Vatican II revision in English published by Catholic Book Publishing Company. But for those attached to the traditional liturgy there is much value in the older version of the Little Office -- a mainstay of lay saints through the ages (like St. Thomas More). Praying the hours has been one of the greatest blessings for me in my own spiritual life. I have been fascinated with the various breviaries produced over the years. Lithography (otherwise known as "offset printing") and typesetting were trades I actually learned as a young man (in order that if my education in higher learning should ever fail I would at least have a trade to fall back upon). Printing and the construction of books in general had been a fascination of mine since I was a young boy, and I learned many techniques of my trade by studying the history of printing which actually goes back to the first Bibles and religious books, the majority of which until the 1800s were breviaries and "Books of the Hours." I actually grew to love the Catholic faith and praying the Divine Office by "falling in love" with the construction and art of an older Catholic breviary. So I am always eager to learn more, and really enjoyed this article. A footnote: not to be nitpicking but the word "breviary" is often mistaken to mean "brief" when in reality it comes from a Latin word which in this instance means "encapsulation." The original copies of the Divine Office consisted only of the prayers and a citation of which parts of the Bible to recite or chant in prayer. This meant you had to go between the prayer book and a copy of Scripture for each hour of prayer, and the turning of many pages to locate the Bible texts took up time in these days when such books were big, bulky, and the pages thick. Eventually these sections from Scripture were "encapsulated" or quoted verbatim, copied directly into the prayer text. The Latin word for this actually refers to the fact that the books contain everything needed, including the Scripture texts, and means the opposite of the English word "brief" (I.e., "short") as the volumes of the Office thus became quite extensive as a result. The only connection to the word "brief" in this sense has to do with how much time this saved from having to look up the Scripture texts for each hour, and in this sense employed the other meaning of the same Latin word which means "quicker" as in time but not "shorter" as in length of the actual prayer. The idea behind this "saved" or "abridged" time in doing this came to be applied to the books themselves which, if you own any, including the "little" offices, are actually anything but "brief." The word "little" in references to these other "offices" means "minor" as in "second" in place to the official Office of prayer of the Church. For generations most Christians who owned copies of Scripture actually only owned breviaries or hourly prayers. This changed, of course, after the famous barefoot walk of young Mary Jones inspired the creation of the first Bible societies in the 19th century. 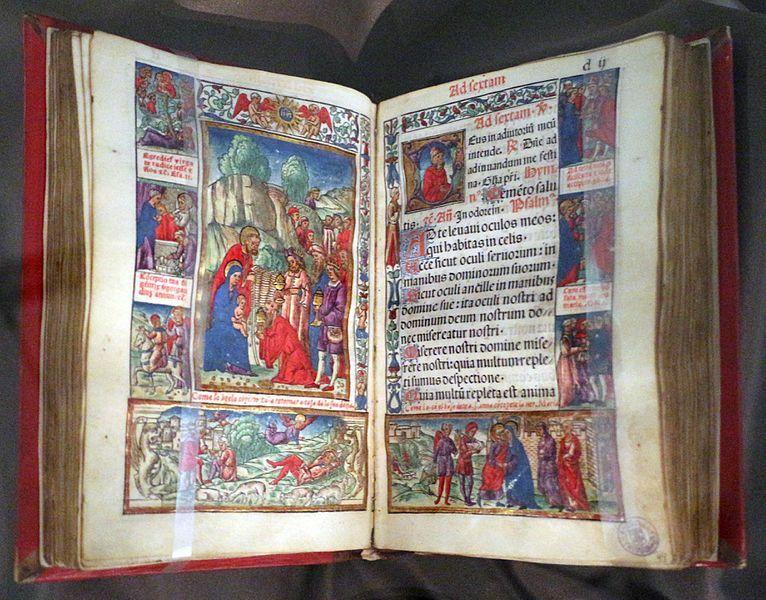 Since then the situation reversed itself, with most Christians now owning entire copies of the Bible but most never owning or even seeing a breviary in person today. Eamon Duffy has done great work on the prymers used in pre-Reformation England -- they were the basis for the collection of prayers that, during and after the Reformation there became the Book of Common Prayer. The prymers included not only prayers and devotions, but collections of the Psalms, the Little Office, the Order of Mass, major feast days, devotions for the dead, litanies, sometimes selections from the Gospels (or even in some cases the text the Gospels), targeted across the spectrum of literacy in England at the time (some prymers were in Latin, some were in a mix of Latin & English, some were just English) and in a variety of bindings (to reach the market range from cheap to extremely expensive).